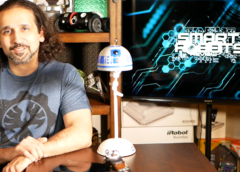 On the premier of Smart Robots Review Elias reviews one of the best robotic vacuums today, the Roomba 980. A special unconventional challenge reveals a hidden talent. We would like to extend a special thank you to Anna Krasnoshapka & Mykyta Serdyuk for assisting us with the unconventional challenge. Their Fred Astaire dance studio is located in Pleasant Prairie and can be reached at pleasantprairiefads@gmail.com.